You’d be hard-pressed to find any homeowner who enjoys cleaning the gutters around their home. It’s a dirty job that leaves one vulnerably and dangerous teetering on ladders. But leaves, debris and muck deposited in your gutters can actually affect the structure of a home. With the buildup of this debris comes clogged gutters and downspouts which create the possibility of ice damming, mold growth and split gutter seams. These problems can increase the presence of moisture in areas close to your roofing elements and other structural elements creating an influx of moisture which can be extremely damaging to any home or commercial building with time. Gutter guards are meant to keep debris from entering gutters and downspouts allowing homeowners to keep their roof and shelter dry and free from damage. And nobody builds a better gutter guard than Gutter Dome. Gutter Dome brand of leaf guard act as your partner keeping your home and gutters protected and keeping you off the ladder. 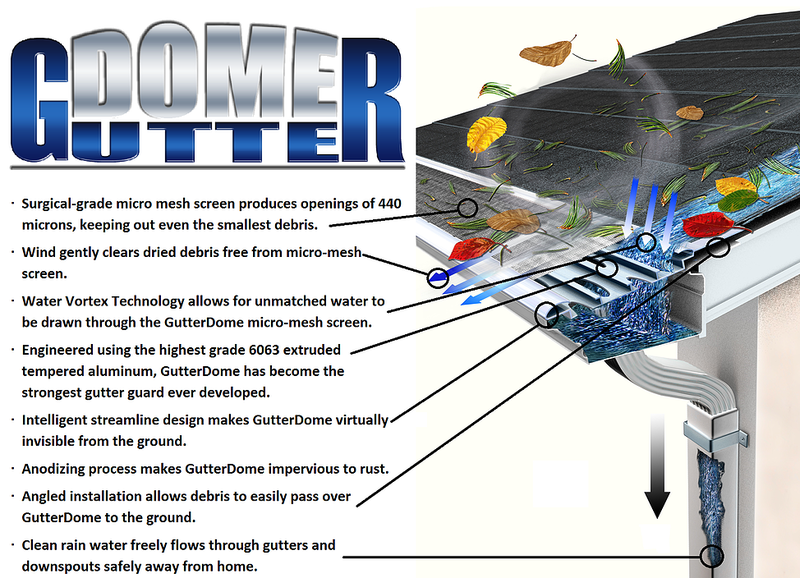 Using innovative materials and construction, Gutter Dome has been proven to keep all types of debris out of gutters while allowing for maximum water flow. Tested at 10 inches of rain per hour, Gutter Dome’s patented micro-mesh grate and surgical grade stainless steel frame work together to provide rugged durability that promises to never rust, split or breakdown. Its angled installation and streamlined design helps to move dirt, leaves, twigs and any other debris from the roof area, gently to the ground below. For a free quote and installation, call the Colorado Gutter Dome team for quick and friendly service that is also unmatched in the industry. Sign up for a fast, free, no obligation estimate. Assured to be the lowest pressure estimate you've ever received!